Now at home, I wonder if they found the Bakery in Hood River. We all were leaving, after three nights at the Hotel Diamond, in Harney County. Sharing delicious meals, comparing notes about birds, hearing stories of each other’s lives, you become attached. We said we hoped the flock of Snow Geese they’d seen the day before would still be there as we drove up past Hines, heading for Burns, leaving behind a still snowy Steens, the huge cottonwood outside our door, and the sounds and songs of Owls, Snipe, Sandhill Cranes that had been our world for those three days. I’d found the beautiful book, Over Here, by Ursula Le Guin and Roger Dorband, on the hotel’s bookshelf. 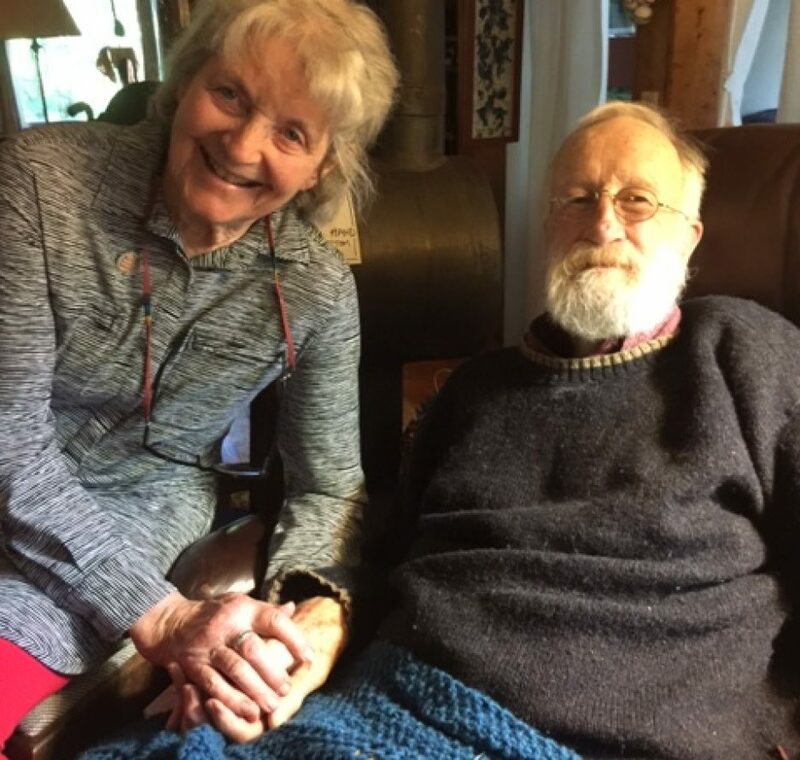 Those friends with whom we’ve spent many days in that same valley over the years have made a collection of Ursula’s poetry and pen-and-ink drawings and Roger’s photographs. I’d found in there a poem of Ursula’s I loved, copied it out one morning and learned it. Making that poem part of me brought us together along that stream where I’ve walked with Ursula, brought to mind drawings I’ve done of fields and haybales, rimrock, light and shadow. Then, driving north, we did see the flock of Snow Geese, a thousand maybe, like a shiny white carpet in the green. And the poem’s sense of recurrence tied us all together. As if to reconfirm, just then, a little ahead on the road suddenly appeared a curious flock of ewes and lambs, venturing onto the pavement as if investigating, not belonging. We could see how they gotten out: there was a gap between the cattle grid and the post. One by one, waiting their turn, they were slipping through the gap, the lambs clean and new, the mothers huge, woolly and filthy, with “daggy bits” hanging off them. Before we really had time to urge them back off the road, they themselves must have thought better of the misbegotten project, because they began going back through the tiny gap, again very orderly, no pushing and shoving, until they were all inside the ranch fence, streaming out into the sunny field where they were at home. I felt a connection to new friends and old, each returning to our home pastures, our “own recurrences,” and all now part of the others. This Akebia vine would overtake me if I sat here a few hours in the sun. Its tendrils already twine around the legs of the rocking-chair I sit in. It’s not hard to imagine its quivering is not only the breeze but actually its growing, minute by minute. And this small being, Lily Alice Bellos, came into the world in a rush, not to be held back another minute, last evening a little after seven. And there she is, already pondering where she is, having her first thoughts, safe on her daddy’s chest. The next day: I visited her this morning. Alex had spent the night with Em and Lily in the hospital. Noah was with Alex’s mother, Debra. Hester and Len are cooking them supper at their house tonight, and Noah asked please that Lily come up while he had his bath before bed. Good to keep an eye on things.